South Sudanese dissident Gen. James Koany Chuol of Unity state has announced his support for the opposition and the appointment of an interim administration. The rebellion is calling for the removal of President Salva Kiir., a photo by Pan-African News Wire File Photos on Flickr. December 26, 2013 (BENTIU) - The commander of the South Sudanese army in Unity state who defected over the weekend claimed on Thursday that oil-production from fields in his state had to be halted due to lack of staff remaining at the oil fields. James Koang Chuol, who took control of the army’s fourth division in Unity state on Saturday, told Sudan Tribune that he had not ordered the shutdown. The decision, he said, was taken by oil technicians who were evacuated from the area on 25 December. The UN says that over 1,000 are believed to have been killed in the fighting. Last week 16 oil workers were killed by their colleagues in a revenge attack for the alleged ethnic targetting of people in the capital Juba. "We are not the one to stop the oil”, said Koang, adding that the oil belonged to the South Sudanese people. South Sudan’s former vice-president, Riek Machar, who is leading the rebellions in Unity, Jonglei and Upper Nile states, said on 23 December that forces under his command will divert oil revenues accrued from the country’s oil wells. Machar denies plotting to overthrow president Kiir but says he was forced to flee Juba in the aftermath of fighting between members of the presidential guards. He told Sudan Tribune that he intended to stop oil revenue remittances reaching the government in Juba. 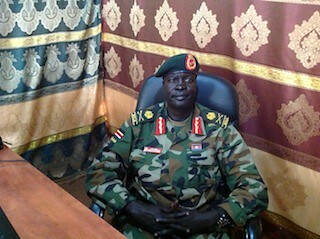 "There is no administration in the country so the oil money cannot be taken by one side, we are not longer in the side of Kiir we have already decide break away from his administration so it is right that and good enough for Machar to say that the oil money to go to International community until we sought our problem”, commander Koang said. Koang, who declared himself Unity state’s new governor on Saturday said the conflict in South Sudan was not about money. The reason for the defection of the army in Unity state, where most of the population is from the Nuer ethnic group, was anger at reports of mass killings of civilians from their community in Juba. Since the reports of Nuer being targetted in the capital revenge attacks have taken place against Dinka civilians in other parts of South Sudan. Two peacekeepers were killed with around 20 Dinka civilians in an attack on the UN base in Akobo, in the far east of Jonglei state last week. Machar has also claimed to be in control of Upper Nile state, South Sudan’s second largest oil-producer. Fierce fighting has been reported in Malakal with both sides claiming to be in control of the state capital.